The Biggest Loser Ultimate Workout for Kinect is a decent game that makes good use of Kinect’s motion tracking, provides the most exhausting cardio workout available in any Kinect game to date, and dips its toes into the water with Kinect functionality, but in other ways is nothing earth-shattering. When the Kinect launched in November 2010, there were two “pure” exercise titles that launched with it, Your Shape: Fitness Evolved and The Biggest Loser: Ultimate Workout. I’ve already posted my review of Your Shape: Fitness Evolved. It is an excellent workout title that literally takes fitness gaming to a new level with innovative use of the Kinect, including showing you alongside your personal trainer and a variety of extremely fun mini-games. It is, thankfully, nothing at all like its predecessor on the Wii. 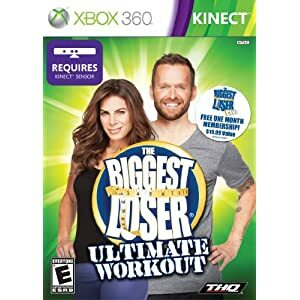 The Biggest Loser Ultimate Workout , also makes excellent use of the Kinect. During exercise routines you’ll see your own figure in the lower right-hand corner. As with Your Shape the figure is silhouetted, a good thing because this way you can’t see how pudgy I really am in the demonstration video below. I found this execution to be a little lacking compared to Your Shape’s–with Your Shape you can compare exactly how well you’re doing the exercise because your silhouette is the exact same size as the trainer’s–here, Bob or Jillian still take up the bulk of the space and you’re relegated to a small corner. One thing to also realize is that you need a LOT of space to work out (about 8 feet back and 12 feet across), and even the slightest variation may confuse the camera (for example, my camera originally didn’t have a clear view of my entire floor, so I tended to disappear when I got on the floor to do exercises on the floor like push-ups). In terms of game play, The Biggest Loser is almost identical to The Biggest Loser Challenge on the Wii. You start out with a fitness test, after which you can choose your level of intensity. You choose either Bob (nice) or Jillian (stern) as your trainer. The advanced workouts are extremely intense, much more so than any other Kinect game at the moment. There’s a variety of exercises to get your heart pumping, from jumping jacks to lunges to boxing moves to yoga poses (which I really, really need to work on). It takes getting used to positioning your body just right so the camera recognizes your movements (you’ll have to face the camera for some of them, turn 90 degrees for others). You need to be standing in exactly the right spot for your motion to be properly detected. During exercises, your silhouetted character will glow green when you’re doing the exercise right, and will glow red when it doesn’t think you are. What I found was, as long as I had a lot of workout space and set up my Kinect to be able to view my entire surroundings (even the floor), the motion tracking was fairly accurate. But if you’re at the wrong angle or too close or too far to the camera, the system starts having a hard time detecting you and you may get nagging telling you to “squat lower” or “punch farther” or otherwise correct your posture. That’s a cool feature when it works, but when you’re already squatting as low as you can or punching as far as you can, it gets annoying. There are some features where THQ is clearly trying to make full use of the Kinect’s advanced features. There’s a “body scan” that measures your dimensions–I’ve found that it’s hit or miss. Another interesting feature is in the middle of your workout, Bob or Jillian will ask you how you’re feeling (asking if you’re thirsty, if you’re tired, etc.). You can respond back with your own voice, which adds a pretty cool level of interaction. One of my biggest gripes with the game, and you’ll notice this is becoming a trend, is that the home menu controls are difficult to use. Once again, going through and selecting menu options is completely inconsistent with other Xbox games. Menu options aren’t intuitive, and selecting them take far too long. Still, if you’re a fan of the TV show and especially Bob or Jillian’s style, this is definitely a game for you. You’ll appreciate the familiar settings, catch phrases, and challenges. And the use of Kinect’s unique capabilities make it the most advanced The Biggest Loser game yet for any system.